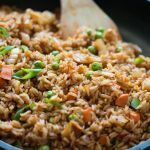 Quick and easy Kimchi Fried rice with tons of flavour from Kimchi, Garlic, ginger and gochujang. Throw in some peas, carrots and top it with sunny side up for a delicious meal. Rice, Kimchi, peas, carrots and to amp up the flavours there is ginger, garlic, say sauce and gochujang. This one-pan meal is healthy and wholesome. And not to forget the health benefits of Kimchi. A new Korean food fan here. I don’t know what took me so long to give this amazing cuisine a try. But I glad that I finally did because I am absolutely loving it. I absolutely loved all the flavours. To be honest I actually had tried Kimchi a few years back and didn’t quite liked it. It tasted kinda weird and then I didn’t bother to give it another try. In a recent visit to a Korean place, I tried their Bibimbap. All those layers of flavours and texture in every bite were mind-blowing. I ended up buying a jar of Kimchi and a tub of gochujang from a nearby Korean Store. 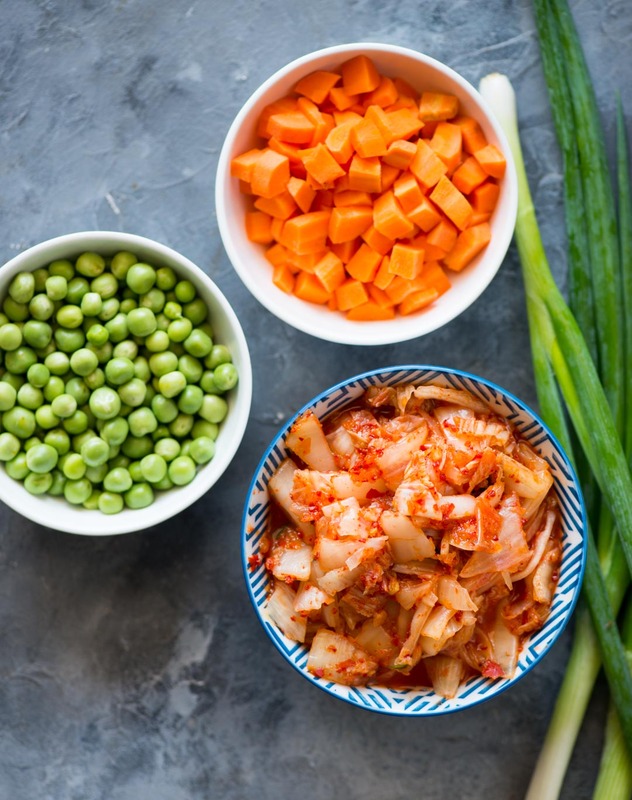 Kimchi is known to be healthy probiotics for guts and gained its popularity in recent times. Chinese cabbage also is known as Nappa cabbage is fermented in Radish, salt, sugar, Korean chilli powder etc. The fermented cabbage is supposed to good for your gut health. There are supposed to be different ways of making Kimchi. I have never tried my hands in making Kimchi at home, though it is there in my todo list. Kimichi has a very distinct pungent smell to it. You might not get impressed when you taste it for the first time. So if you are planning to give it a try, then I would suggest try it from some authentic place. It is an acquired taste and I am sure over a period of time you will start loving it. 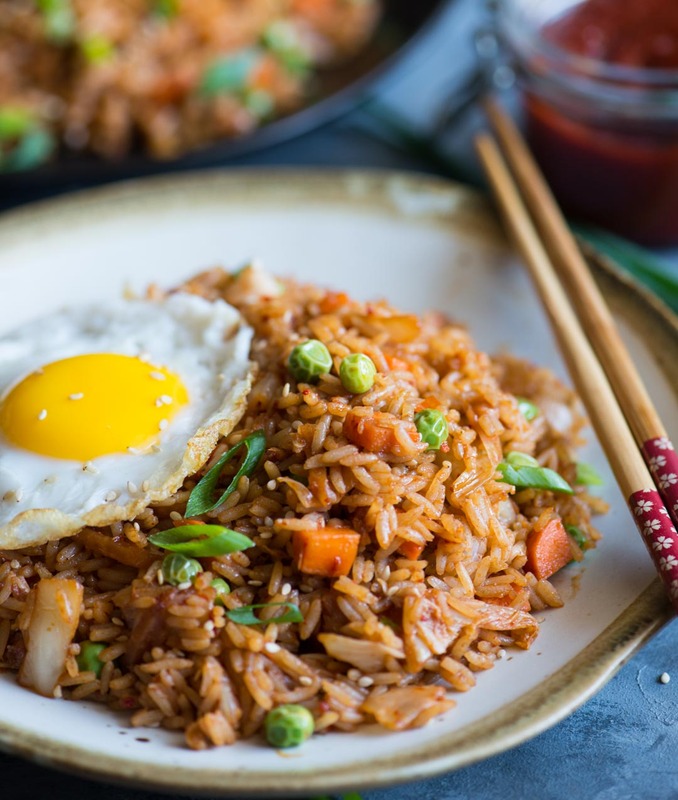 Good Quality Kimchi: Kimchi is the star ingredient in this fried rice. So use a good quality mature Kimchi to get best of the flavours. Use a day old rice: For best result use at least a day old rice. The good thing about a day old rice is the fried rice would be fluffy and soaks up all the flavours really well. 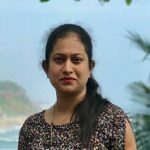 If you are using fresh rice, then make sure it is completely cold. You can spread freshly prepared rice in a plate, separate the grains with a fork and let it cool down. What to do with Kimchi Juice? Kimchi juice has lots of flavours and no way you can discard it. 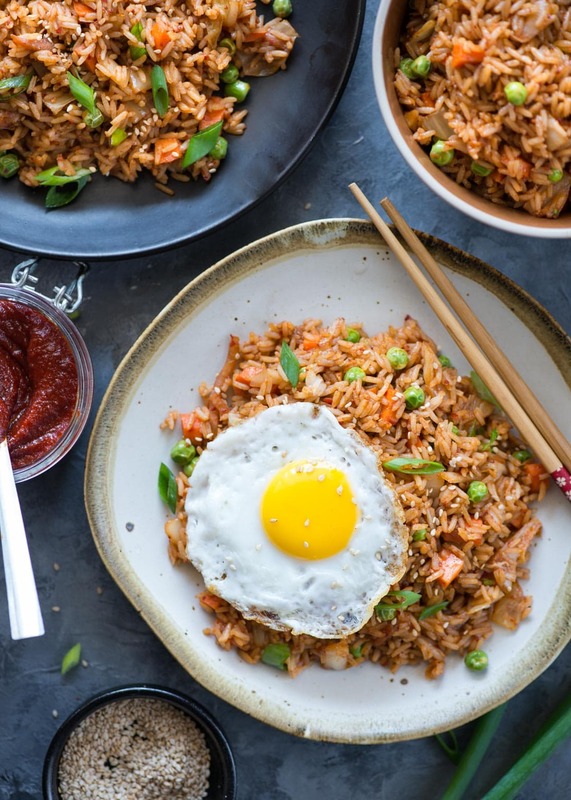 But if you add kimchi along with its juice then you might end with soggy watery fried rice. So to begin with squeeze as much juice as possible from the kimchi. Once the kimchi is cooked, we will add a certain amount of Juice back to the pan. 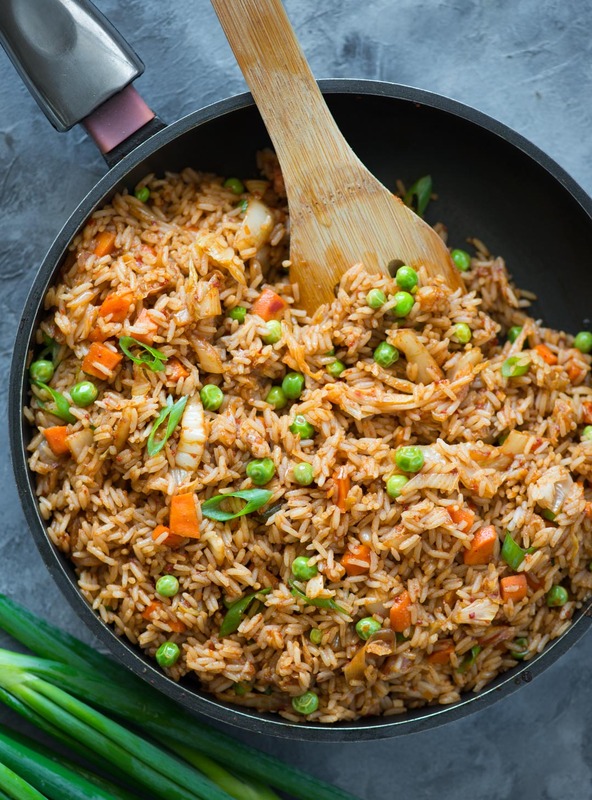 Vegetables: Adding veggies to the fried rice is a good way to sneak in the veggies. I like to add peas, carrots to it. Add-ons: Fried egg on the top while serving is what I like. If you are not a fan of runny sunny side up, you can also make scrambled egg in a different pan and mix to at the end. Chop Kimchi to small pieces. Squeeze as much juice as possible and keep aside. Take about a half cup of Kimchi juice in a bowl. Add soy sauce, gochujang, Sesame Oil. Mix well and keep aside. Take a wide pan or a wok. Add oil and heat. Stir in minced ginger and garlic and Cook for 30 seconds. Then add chopped Kimchi. Cook for about 1-2 minutes until the kimchi is fragrant and start to caramelize. Add kimchi juice mixture made in the previous step and let it cook for about a minutes. Add chopped carrot, green peas. Cook for 1 minute, then Stir in rice. Carefully mix the rice with the sauce making sure not to break the grains. Check the seasoning and add salt if required. Add the green part of the scallion before switching off the stove. While serving top with a fried egg. Adjust the amount of gochujang how spice and intense flavor you prefer. If you don't have gochujang then add red chili flakes for extra heat. Kimchi, soy sauce and gochujang has already have salt in it. So add salt accordingly. You can measure 1.5 cup kimchi and then squeeze the juice out. Else first squeeze the juice from kimchi, then chop and measure about 1 cup. So basically around 1.5 cup kimchi along with Juice equals to 1 cup kimchi with out juice.